Austin College freshmen, like many around the country, were assigned summer reading of The Immortal Life of Henrietta Lacks by Rebecca Skloot, a New York Times bestseller. Common read programs give the new students a first step in their college academics and provide a common experience for the class. At Austin College, issues from the book often are interwoven into freshman courses, particularly in the Communication/Inquiry foundation course of Austin College’s undergraduate curriculum, taken by every freshman. Too, as Austin College freshmen read the book, they were encouraged to share ideas and connect with one another on the College’s Common Read Facebook site. 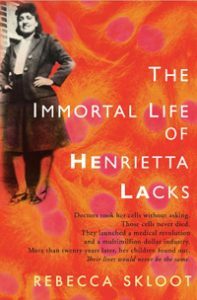 The Immortal Life of Henrietta Lacks explores the issues of ethics, faith, and humanity of the HeLa strain of human cells. The cells, from a cervical cancer biopsy obtained from a 31-year-old black woman in 1951, were the first human cells to thrive in a research laboratory. The cells were easy to replicate and virulent, making them the premier strain for many types of research, used in studies on aging, testing new drugs, and others. Henrietta Lacks never was asked or informed about the celebrity of her cells, and it wasn’t until after her death that her family learned that Henrietta’s cells had contributed in scientific research and breakthroughs worldwide. Freshmen, joined by other campus and community guests, were privileged to hear from David Lacks, the son of Henrietta Lacks, in a convocation September 20. The gentle and unpretentious man responded to questions about his mother and about his family’s struggle to discover the facts about his mother’s medical history. Randi Tanglen, assistant professor of English and a member of the Communication/Inquiry (CI) advisory committee, presented questions to Lacks from those previously submitted by students. David’s daughter, Jeri, also joined them on stage and offered input in the conversation. David Lacks said the family is not bitter about the use of his mother’s cells, but that they wish she and they had known about what was happening. Times were different then, he said, and people didn’t ask a lot of questions of their doctors. He is glad, he said, that people have been helped through the research and testing of the cell strain. His mother, however, died painfully from cancer nine months after her diagnosis, and the family wishes there had been a better outcome for her and some way to alleviate her suffering.